With many of the modern smartphone getting rid of 3.5mm headphone jacks, the users are being forced to switch to a wireless world. The chances are high that you already own a very high-quality wired headphone or earphone which you don’t want to part with yet but you can’t use them as your phone won’t support it. 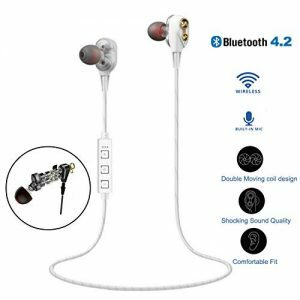 For such situations, Bluetooth audio receivers come to your rescue to save your hard-earned money from being spent on a new pair of Bluetooth headphones and allow you to continue using your current earphones using a tiny, nifty accessory. 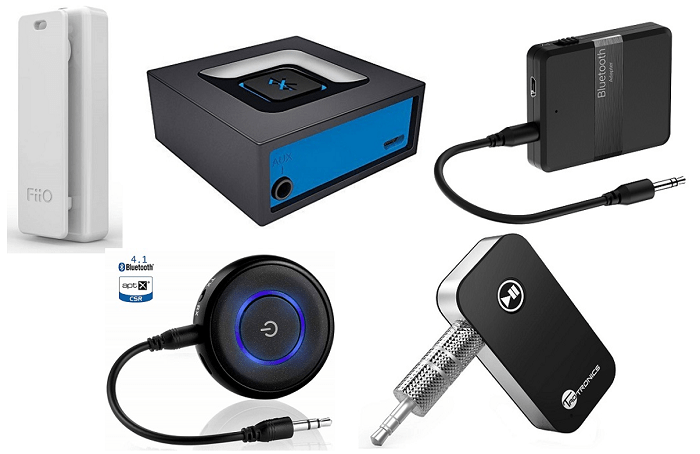 Here are the best of these Bluetooth audio receivers in the market and you can go for any one of them based on your needs. 1) Built using a Qualcomm chip inside, this audio receiver from Fiio offers the best in class experience using high-quality codecs like aptX, SBC, and AAC. 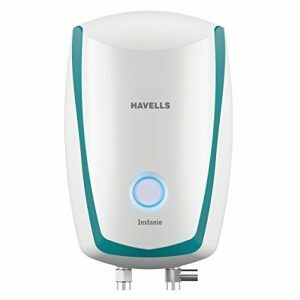 2) It comes with Bluetooth 4.1 that offers a range of 10 metres in line of sight which excellent for this budget product. 3) The company has included a battery of 120mAh that is supposed to last for over 9 hours on a single charge. 4) Charging this Bluetooth receiver takes just an hour and the included USB Type-C port means you can use any modern smartphone charger to juice it up. 5) It has a built-in microphone that helps make and receive voice calls and access voice assistants like Siri and Google Assistant. 6) NFC comes included on the receiver that makes the pairing process even easier. The receiver is compact in size, ideal for use with a smartphone and has a clip to be held on your shirt. 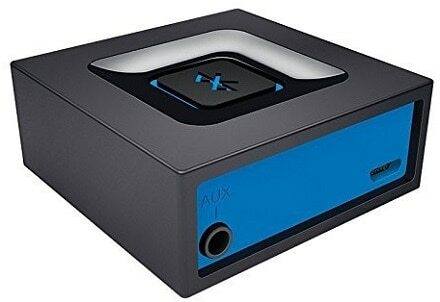 1) Ideal for larger audio devices like stationary speakers, this Bluetooth receiver from Logitech is possibly the best quality product on this list. 2) The company has ensured a stable connection at a distance of up to 15 metres and the receiver remembers the paired devices to repair with them automatically without any hassle. 3) Pairing this receiver with your smart devices takes just a single click. 4) It is easy to operate with a single button included on the top that helps you pair it with devices. 5) Apart from this, there is an audio out port, where you’ll connect the speakers and a microUSB port to provide the unit with power. 6) It is worth noting that the Bluetooth receiver from Logitech doesn’t have an inbuilt battery and needs external power to operate. 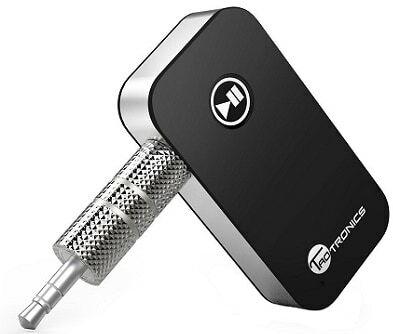 1) This is possibly the tiniest Bluetooth receiver currently available in the market which is great for use inside a car or with larger headphones. 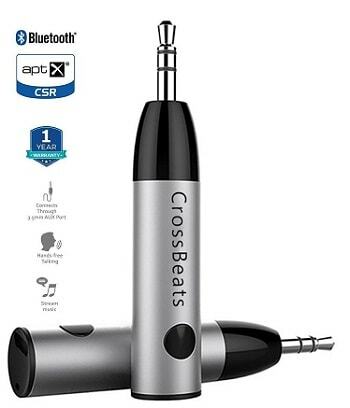 2) CrossBeats has made a product that is barely a couple of inches long and it still offers a battery life of up to 5 hours of continuous playback. 3) Above that, you can play music even while charging, which is a unique feature in this category. 4) A significantly low latency is claimed by the company which is required while watching videos and you can connect it with two devices at once to seamlessly switch between them. 5) It also supports HiFi audio quality along with aptX low latency protocols for a better music listening experience. 6) Using this, you can make your headphones with detachable cables wireless without any dangling cable. 1) As its name suggests, this particular product serves two purposes – making your wired headphones or speakers wireless and make your old TV or PC support wireless audio. 2) If you have multiple older generation devices, then there can be no other option than this 2-in-1 product from Cubetek. It supports aptX low latency that brings down the latency to less than 40ms. 3) With the inclusion of Bluetooth 4.1, you can rest assured that the receiver will remain compatible with almost all your smart devices and even the newer ones. 4) The included battery is rated to last for up to 8 hours and it also can stream audio while being charged which is an added bonus. 5) Dual pair mode is another feature included that lets you connect two headphones simultaneously. 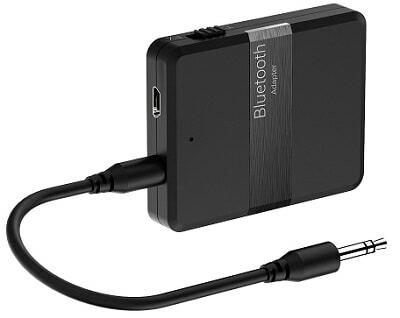 1) Yet another 2-in-1 Bluetooth transmitter and receiver is here to solve multiple purposes with a single device. 2) This model comes included with an audio cable along with an extra two-pin cable that will help you make even the oldest CRT TV wireless; while the USB cable will help power it. 3) Support for advanced codecs means that the audio latency has been reduced to less than 30ms. 4) Its battery takes 2 hours to fully charge and can survive a continuous playback of up to 13 hours depending on the mode selected. 5) With the inclusion of Bluetooth 4.1 standard and other popular and high-end audio codecs, this product stays compatible with most Android and iOS devices. 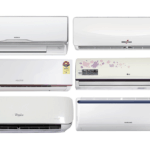 6) With these, the company is also offering a warranty of 12 months with this product. 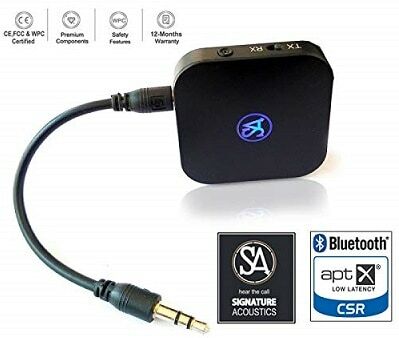 1) With this Bluetooth audio receiver, you’ll be getting a more compact design than many others but it will still include multiple added features. 2) Like the buttons placed in the centre can be used to interact with the music and also summon voice assistants like Siri. It has an included collar clip for use with earphones. 3) Apart from that, an air vent mount for your car comes included inside the box and you can use it to make your car wireless as well. 4) You can connect up to two devices simultaneously with this receiver and switch between them as needed. 5) It offers a great battery backup of up to 10 hours and takes just 2 hours to charge up back. 1) If you’re scouting for a Bluetooth receiver specifically with a lengthy battery life then this product offers the same with its rated operating time of over 12 hours. 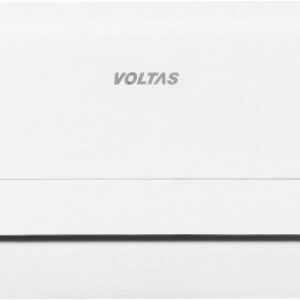 2) This compact receiver charges really quickly to offer that stellar battery backup. In addition to this, you can connect up to two devices with it to play music on either device alternatively. 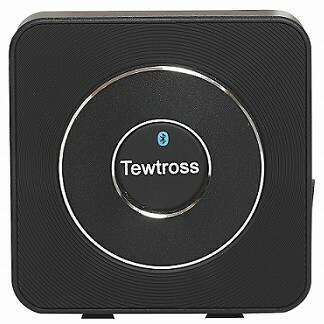 3) Offering a range of 10 metres, the Bluetooth receiver from Tewtross can let you use it uninterrupted. 4) The company has included a universal compact design to make it ideal for a range of products including headphones and large speakers. 5) With all this, the receiver comes with a warranty of 1 year. The onboard buttons offer an easy set of controls for your music as well as calls. 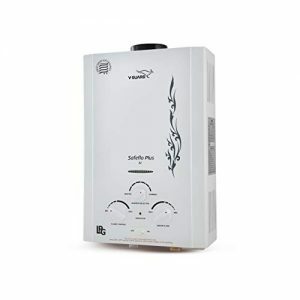 1) Available in a small cubical size, this product from VeeDee functions both as a transmitter and a receiver, serving you dual purposes instead of one, like many other products. 2) The device comes with a support for Bluetooth 4.1 for ensuring its support for a wide variety of smart products and it is also aptX certified for a reduced latency. 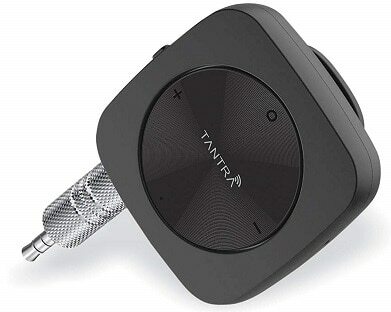 3) While using it as a transmitter, you can connect two Bluetooth headphones or speakers to play music on both at once. 4) It supports simple plug-and-play operation and you can use it continuously for over 10 hours on a single charge. 5) The package comes included with all the necessary cables that you’d need to connect and charge the audio receiver. 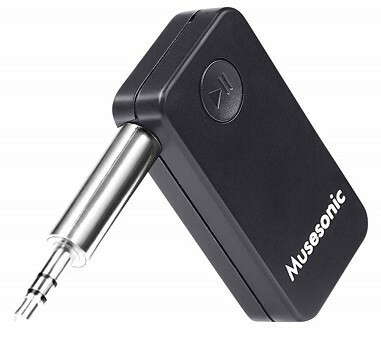 1) Offering one of the highest value for your money, Musesonic has included a number of features that are found in many higher-end devices. 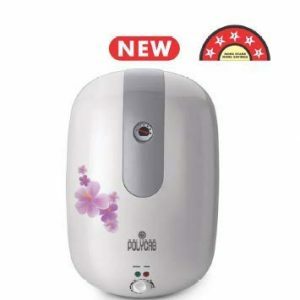 2) It comes with a compact yet functional design that will work for both in-house use as well as in your car. With the included audio jack, you can use it virtually with any device supporting the port. 3) Much like other products, this one too offers connectivity to multiple devices, with the number capped at two. 4) The receiver does let you play music while it is being charged, so it saves a lot of your time if the battery dies midway of watching or listening. 5) Though, the chances of happening that are really thin as the receiver offers a battery life of 10 hours. 1) Premium build and look are the differentiating factors of this audio receiver that brings along a great set of features. 2) The receiver has a size of a car key and includes physical buttons to control your music and calls and all these buttons are easily reachable while also supporting Apple Siri. It charges via a microUSB port and gives a battery life of 7 hours. 3) The inclusion of Bluetooth 4.0 ensures its compatibility with most smart devices of these modern days. 4) Using the inbuilt microphones, you can make and take calls and its buttons give you a hands-free access to calls. 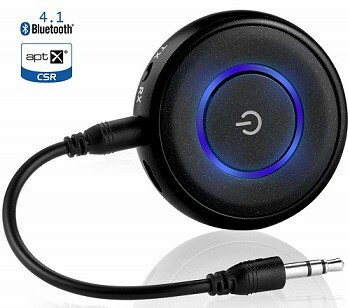 5) A range of high-quality accessories come along with this receiver and the company offers a warranty of 1 year on it.